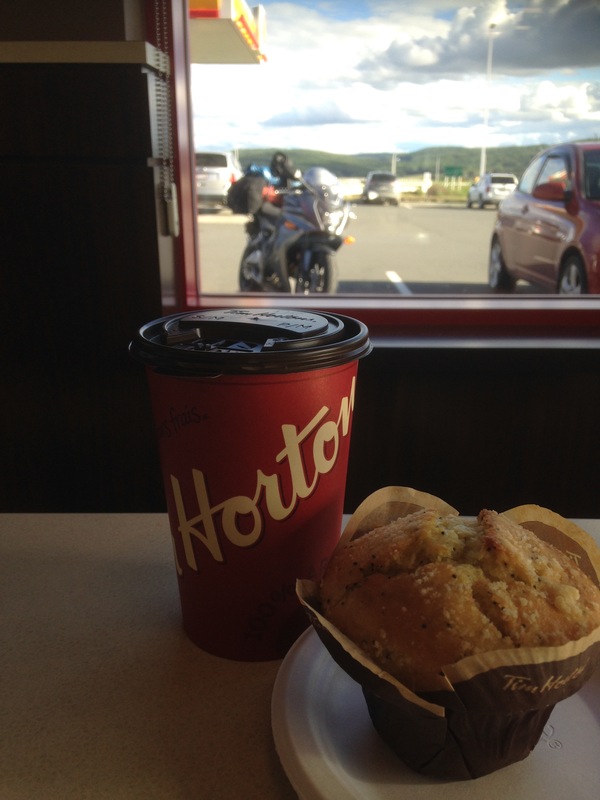 As most readers know, the ancient Canadian motorcycle proverb goes : “A journey of 1000 miles begins with just one Tim Horton’s.” With this in mind I undertook an epic trip this summer, aboard an almost totally inappropriate motorcycle. Trekking from the stoney shores of Nova Scotia, across the forest wastes of New Brunswick, through the idyllic St Lawrence river valley to the boggy Boreal forests of northern Ontario, I’d take on the historic French River in a canoe as well as a mid-life existential crisis. Back in February when I turned 40, I was gifted a week-long paddling trip scheduled for late July. Being from Sudbury, nothing could be more exciting to me than spending days outside in the mosquito infested bush of my native land. Fired up, I began planning logistics. How will I get to Ontario from Halifax? How waterproof are my boots after seven years? Does the Hungry Bear Restaurant and Trading Post still sell beaver tails? The date of my trip rapidly approaching, I asked Canada Moto Guide editor Rob Harris if this was a story worth doing for the magazine, via a motorcycle. Thrilled, he immediately offered me the use of CMG’s BMW R1250GS long term test bike, an adventure touring rig so sumptuously appointed for such a journey that I immediately began rewriting a scathing Insider piece about BMW that had been percolating on my desktop for months. Sadly, however, Harris revoked the deal only a week before departure, offering only his imperious editorial privilege for an excuse. He did secure me a replacement, however now instead of riding thousands of kilometers through uncertain New Brunswick and cratered Quebec highways aboard the luxurious BMW, I would have to make do with a Honda CBR650F. Styling hits all the contemporary buttons. Honda and I are no strangers to cross-Canada touring. 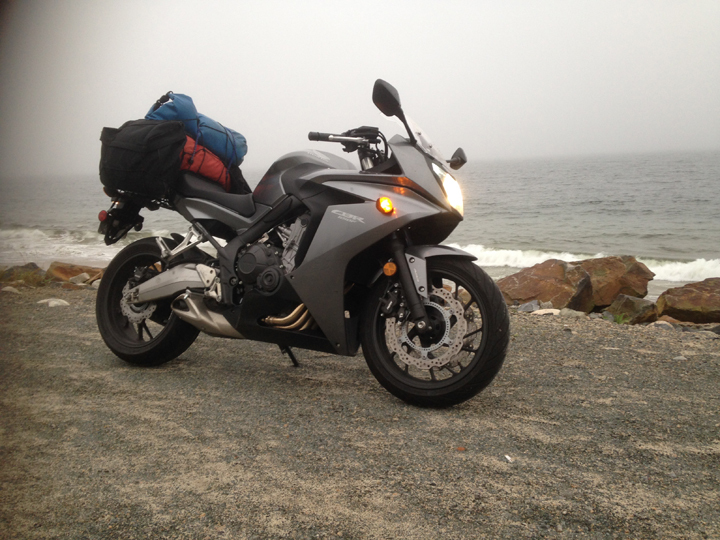 Back in 2011, I rode the then new CBR250 from Toronto to Halifax, on a dare from Cycle Canada’s editor Neil Graham to prove the point that small bikes are totally capable of serious touring. The CBR650F is nearly three times the capacity of that mighty little bike I praised so highly, but is it three times the motorcycle? 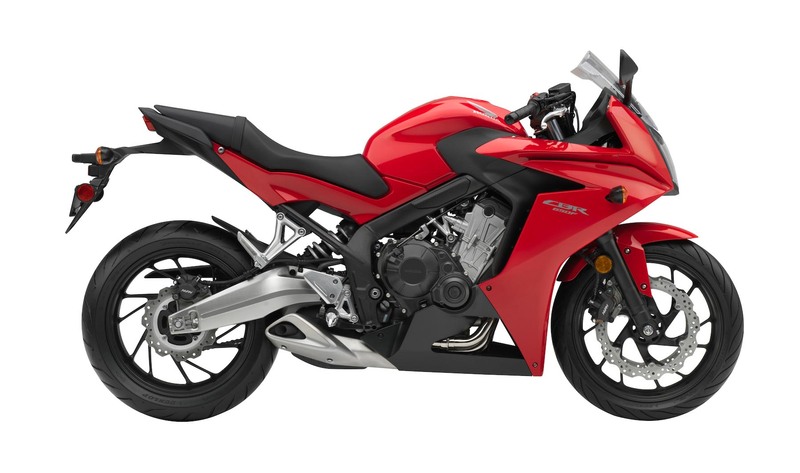 More to the point, The CBR650F is a sporty model, and I had to schlep a week’s worth of camping gear and supplies, plus my older, less nubile self, the whole distance. Would it do? Would I? 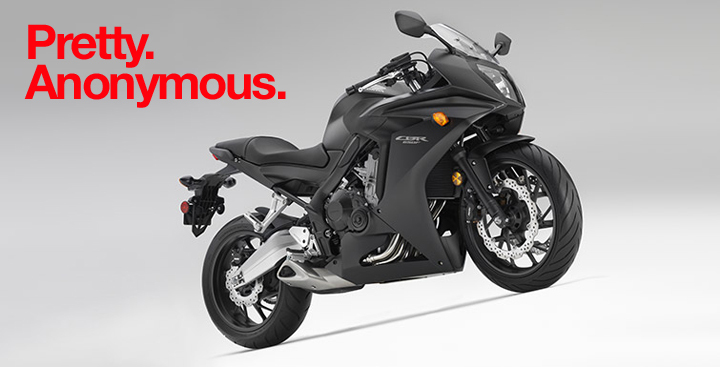 The CBR650F is the latest offspring of the most successful sport motorcycle in history, the CBR600. First sold in 1987, the lozenge-shaped middleweight Honda won millions of adoring fans by being exactly in between too-sporty and not sporty enough. With a plush dual seat, handlebars mounted above the top triple clamp and smooth, predictable handling and power, the CBR600 won absolutely no races of any significance for decades. But it crushed the race to the showroom financing department, where it decimated the 600cc rivals from Yamaha, Suzuki and Kawasaki. No other 600cc sport model of any sub-type, with any engine configuration, could match the Goldilocks all-round capability of the Honda. 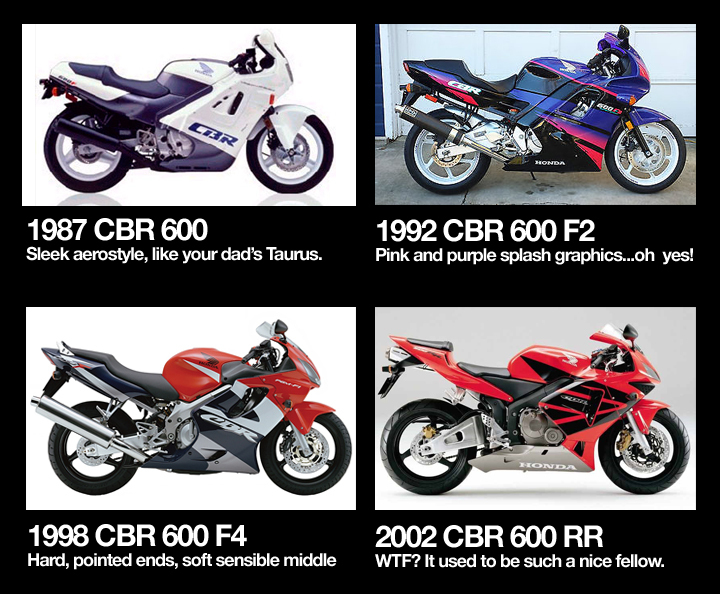 The evolution of the CBR 600 from the nice boy next door to the neighborhood hooligan. Ironically, I liked the hooligan best. And so it was until 2002, when the company known to the motorcycle universe as “Mr. 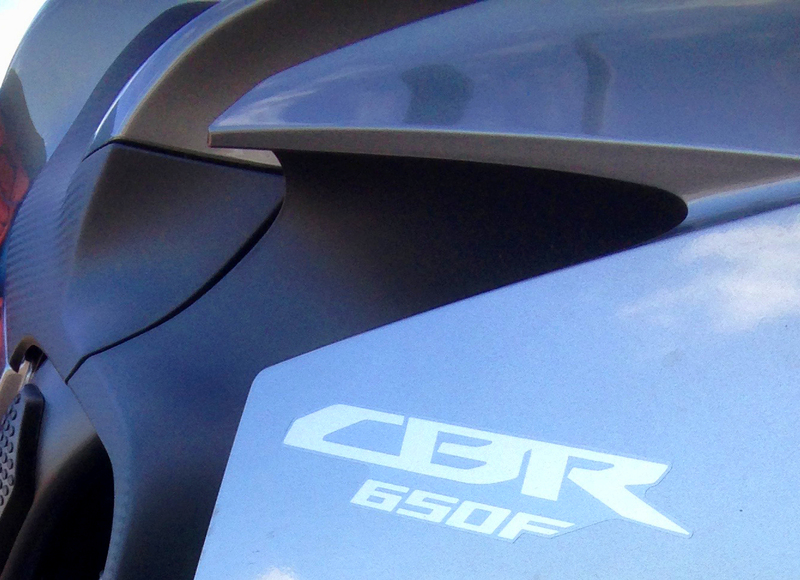 Sensible” went brutal, reincarnated as the CBR600RR. With Rossi-Honda era race bike styling and an all-conquering spec sheet, the RR took on and handily beat the then race replica leader, the Yamaha R6. The 600cc arms race took off and with each new generation, the CBR600 drifted further from where it had found so much success. Sure, there was the old CBR600F4i model, which limped along in co-production many years after its sell-by date, but that old chestnut was out of touch with the reality of modern motorcycling. Meanwhile, that whole adventure bike thing exploded and all the middle-of-the-road types (*cough* editor ‘arris *cough*) decreed that no self-respecting middle-aged man should be seen on anything with full fairings and rearset footpegs. The sensible middle weight sport model was now a Suzuki V-Strom. Well screw you, adventure men. I grew up in the 80’s when adventure meant weaving at unsafe speeds down the Don Valley Parkway at 2am aboard fast bikes with pink and turquoise splash graphics. Bikes with awesome, lethal sounding names like Ninja, Katana and Hurricane. And Thundercat… which sounds decidedly less lethal and more like an after school cartoon, but we’ll let that go for now. Today, with kids, a mortgage and other responsibilities, I can’t actually ride fast like that anymore. Also, the Don Valley Parkway at 2 am is packed with SUV drivers texting on cellphones. But never mind, my mid-life crisis ego still wants to believe that, should the right circumstances occur, I could be that guy again. Fast. Cool. Free. Picking it up I notice that it is a typical Honda. The design is current, very fashionable and almost completely forgettable the moment you walk away from the motorcycle. The build quality is good, but not quite up to the standard usually set by Honda. The CBR650F is made in Thailand which is how it gets to be so good for so little. But unlike the Japan-built VFR800F I tested last autumn, the paint, plastic panel gaps and fastener details are a little thinner, a little less tight, a lot cheaper looking. Mind you, that makes it even with the quality of say, a Yamaha or Kawasaki product, and still way better than anything made in Europe bar Piaggio products like Vespa and Aprilia. Plastic panel gaps are not up to Honda’s usual level, but still excellent. The layering of gloss fairing panels over textured black inner panels is the one area of design brilliance. Riding it the first miles is a lesson in Hondist perfection. Except for a terrible induction noise at low rpm and some minor annoying vibrations. My example is brand spanking new, so some tightness is expected, but I was genuinely disappointed. The riding posture however, cannot be faulted. From one kilometer away I was already naturally comfortable with the handling, like I had owned the bike for years. By the time I snaked the machine home along the local coastal road 45km down shore from Halifax, I was smiling and throwing the CBR into corners with abandon. Packing up for the trip was not simple. Two large dry bags, with a tent, sleeping roll, sleeping bag and other gear totally overwhelmed what passes for a passenger seat. There is one chromed steel luggage mounting bolt, but nowhere else to tie down bungees or straps. Fortunately I have spent years braiding and untangling little girl’s hair, so I configured a system of lines and elastics that secured it all to the Honda. Two dry bags,a pair of Belstaff throw over bags, and the Nova Scotian weather could not faze the Honda. Next a set of Belstaff throw over saddle bags went on. Containing my clothes and shoes, they ended up stretching sideways past the dry bags, making the slim CBR as wide as a city bus, with a corresponding effect on my aerodynamic drag coefficient. Those Belstaff bags deserve severe criticism here. Purchased in London a mere 18 years ago for almost $50, they have developed a hole in one side, a result of flying off a Yamaha XJR1300 on a Dutch cobblestone road. Then they had the temerity to leak in the rain, despite being made in England, a country known for its moisture. As a final insult, they have mould marks from where they sat in a flooded basement for a week. I cannot stress enough how utterly disappointed I am in this shoddy product, but necessity being what it is, I pressed them into service one more time. Riding west from Nova Scotia is an exercise in self-restraint. 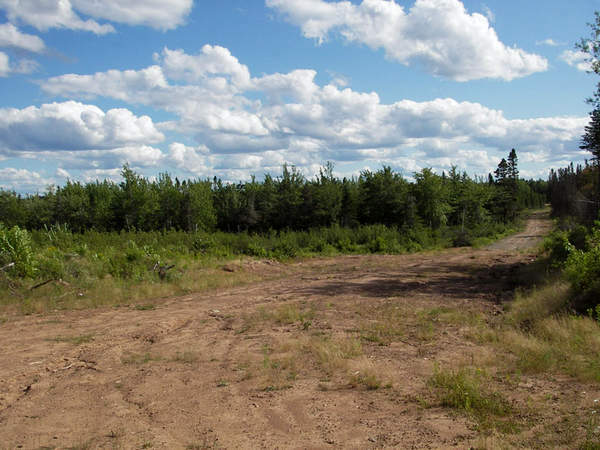 As the Honda purred along in total comfort and control into the marshes separating the province from the rest of Canada, the foreboding savagery of New Brunswick’s wilderness overwhelms you. At first, you enter Sackville, a little university town and world headquarters of the Canada Moto Guide, but then it goes dark. Neil Graham once framed it perfectly when he said “I don’t get New Brunswick.” No one does. It remains a Canadian enigma, like Relic from The Beachcombers or the fortunes of the Toronto Maple Leafs. But the trusty CBR banished all my fears, assaulting the twisting roads along the St. John river from Jemseg to Grand Sault with the vigor and confidence of a moose charging a semi. The same could be said for me, as the kilometres rolled past. The middle-man Honda sports bike began peeling away the layers of entropy that build up on my motorcycle ego for the past decade, revealing a past me. A younger me. A lighter, less burdened me. Let’s face it, middle age means risk aversion. It comes at different times to different people, and can equal many things. To me, it was the stunning realization that spontaneous behaviour was no longer possible, or even an attractive option. There are consequences to selfish choices, which of course there always were, but at one point I came to the conclusion that those choices were potentially destructive to the life I now love. Riding a sport motorcycle fast was one of those risks I could no longer abide. Then there are physical limitations, from the obvious things like joints stiffening to the less obvious but far more devious ones concerning our actual ability. When we are very young, enthusiasm and fearlessness compensate for our rough edges. But what I found was that as I got a little older and the fear set in, my lack of skill on a fast motorcycle became plain to see. That is hard on the ego, especially at a time when you begin to experience a whole raft of fears about aging parents, raising children and our fragile prosperity. But I resist. I love sport bikes because I am a product of 80’s fast music and fast living. Sport motorcycles are, for me, the epitome of the genus, the non plus ultra on two wheels. I like to cruise from time to time, or the look of many different motorcycle genres, but the fully faired speed form of a superbike is what makes my heart beat faster. They are the beasts that made me want to ride in the first place, and drove me to emigrate to Europe to fulfill my dream of becoming a motorcycle designer. By the time I entered the wide expanse of the St. Lawrence river valley in Quebec, these and other thoughts were on my mind, as the amazing thought incubator of a long motorcycle ride amplified earlier threads of contemplation. It grew dark, I sped up. 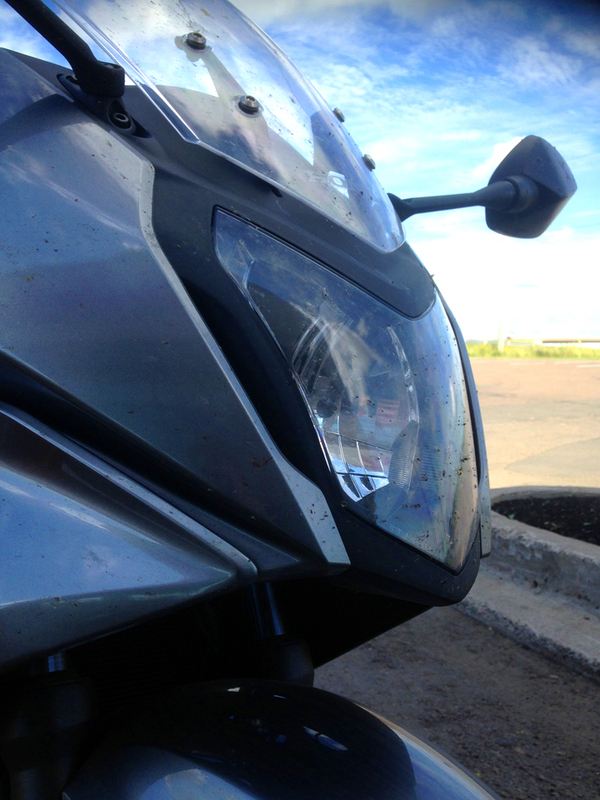 The Honda CBR650F and I were in our element now, symbiotes on a mission. I had spent 11 hours in the saddle and was eager to press on. Only some sharp pain in my neck and the ever present threat of wild life reminded me of the need to stop. Steel main frame is excellent and handsome, as is the cast alloy engine hanger. Honda made a lot of good design choices in crafting the CBR650F, the kind that reveal a clear understanding of rider’s deep seeded needs. 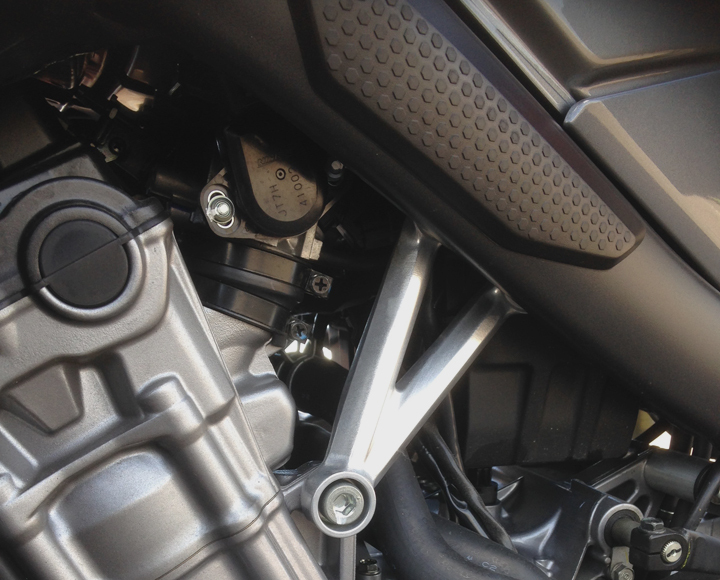 Unlike the obvious modes of thinking that dominate European brands, where spec creep means an ever upward spiral of complexity, capability and cost, Honda knows the intended audience of the middle man sport bike. Instead of an aluminum frame, they saved money and made a perfectly capable (and attractive looking) steel one using hydroformed spars. The suspension is generic, there are no radial brake calipers and not one LED was used in the headlamp. Using modern manufacturing techniques on old-technology solutions yields a motorcycle that is 80% as capable as the seriously more intense CBR600RR, but at a third less cost. The really smart bit is that it exceeds the riding capability of 100% of its target market. Riding out the next day, heading west through the Kawartha Highlands east of Ottawa and into the heart of Haliburton and Muskoka, the CBR650F reveals the genius of those wise design decisions. I carve and carve and carve. Each corner gives me greater confidence in myself, and yet still lets me know that I am far from the motorcycle’s limits. Riding past my personal limits while feeling safe and in control for several hours on end is a tantric experience. I am in a state of everlasting joy that is difficult to describe, even more so from a sofa several weeks later. It is here that I became a disciple of the Honda Way. After so many years as a Yamaha guy, I see the wisdom of being the master of the middle. I am not exceptional, I am just average. Yamaha, like some Japanese Ducati (in thematic terms, anyway) tries to make every machine an expression of the limit, of what is possible on a given type of motorcycle. More. Better. Lighter. Newer. Like the symbol on their logo, Yamaha tunes machines so that a master can wring utter magic from them, the expert rider and motorcycle together achieving more than either could as individuals. Yamaha planners call this the “1+1=3” theory, and it has been successful for them and the legions who dream of becoming masters themselves. Honda is not for them. It is for me. Probably you too. I am a middle man in the beginning of middle age and I can at least admit and accept my limitations. I am no racer, and will never be that guy I aspired to be as a teenager. But I caught my reflection on the bike rolling to a stop next to a store window, and looking back at me was a trim man in black on a wicked looking sport bike. A reflection of the motorcyclist I wanted to be. The Honda CBR650F was a companion rather than a gruelling instructor, which at this point in my life is what I want. It does not set my pants on fire thinking about it, or when I look at it, nor am I particularly mindful of it as a motorcycle in my memory. But it was the best experience I have had on a motorcycle in years, perhaps one of the very best ever, which is something I am constantly mindful of. I arrived at The Hungry Bear restaurant and trading post, the Honda plastered in bugs and covered in dust. I greeted my brother as we exchanged enthusiasms for our coming canoe trip. The Honda was parked at an outfitters, unpacked and forgotten until the end of our expedition. When I returned to it, suntanned and filled with new skills and memories on white water, I approached the CBR like one does an old friend. No welling up of emotion, just a sense of affection. Some boast of worn down foot pegs, but for guys from northern Ontario it’s about flies plastered on bodywork. I reloaded the bike with dirty bags and muddy shoes, pulled on leathers that were baking hot from spending days in the trunk of my brother’s car, and simply rode off. All I was thinking as I slung my leg over the seat was getting back into Ontario Route 141 to find that feeling again. The unbridled joy of riding a motorcycle that fits you. The styling could be a little better. The fuel range could be a little better. Then again my handling skills could be a little better too. At the end of the day, a great motorcycle is the one you want to ride. I want to ride a CBR650F to the end of the earth, and back again. The middleman Honda sport bike made me happy on a twisty road, comfortable on the highway, and feet safe in a wrath-of-god nighttime thunderstorm. Best of all, it took me back through time and reacquainted me with myself. For $9,500, that is quite a bargain. Motorcycle aside, this is a very well-written article, the kind that makes me want to read everything else you’ve written. @canadamotoguide you have a gem of a writer here. What a incredibly purposefully written article. Like the bike it was designed for, I’m sure this article will answer the question a middle man like the soon to be me had left about this bike. Is it built for me, is this maybe my back to the sport bike. Thank you so much for relaying that experience to us. Twice now I’ve felt the need to read it again. I think what I appreciated most from this article was your comparison of Yamaha and Honda. I’ve always wondered how the big 4 compare with one another and your explanation has brought me that much closer to answering this burning question! Wow. What a great read. Really makes me want one. Givi makes full sets of luggage for these, for those who are sport-touring oriented. You see me late on this one but I also have to say how much of a great read that was and that Toronto to Halifax on a Honda CBR250R story I have read numerous times . And I can see here in the comments and in the said article about the Gilera SP-01 , what a good looking bike that was ,owning an Aprilia RS 125 and I can totally relate to your comment This said ( Had to get it out of my chest ) the CBR 650 is a bike I just very recently took notice of, a bike that answer the questions of many while still be ignored by most. Thanks for this brilliant article. Bought my matte black 650F in February and have been loving it ever since. Great article btw. I chuckled at your mention of this being a great bike for the middle aged. I’m 27 yrs old going on 45 so that makes perfect sense! I’ve always been a practical person. Although I’d love an R1 or whatever, the 650F is all I’ll ever need. The perfect everyday sport bike for the young (and young at heart). Rode this bike. True, the engine is a real gem. Will pull happily from almost any gear and will save the need of playing too much with gear. Good or bad – this is personal prefference. From Zero speed there’s a jerk and I thought that the EFI is the basic, cheapest Honda could find. I was very dissapointed with finish of the bike. So, we have a cheap to buy and keep bike. Its obvious where the cutbacks were. The engine is great and it is easy to get accustomed to. Does the fairing do a decent job of keeping the wind off? 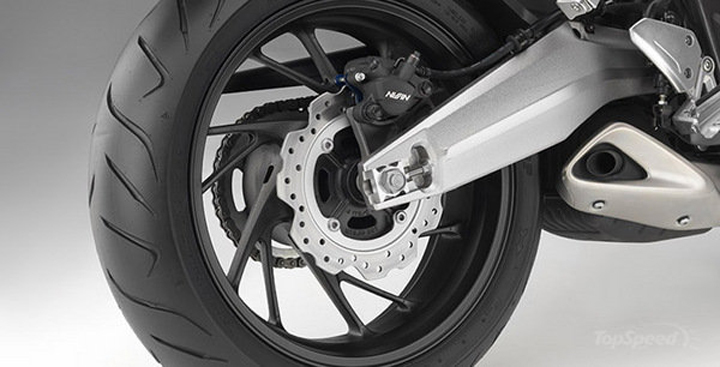 When I sat on a CBR650F at a local dealer, it seemed to me that the clutch cover on the lower right stuck out so far that you ended up hitting your lower leg against it constantly and impeding access to the rear brake pedal. Did you notice this or you just got used to it after a while? The fairing is excellent. I am 6″ tall, with most of it in legs, and I never fouled on the clutch basket or anything else. During a torrential thunderstorm in Quebec the fairing lowers kept most of the spray off my boots and knees, despite the bike’s diminutive width. I have a good photo taken the day after the storm, showing the dirt streaks left by the rain, and it clearly demonstrates what aerodynamicists call laminar air flow: ie. perfectly parallel lines of dirt that indicate smooth, high speed, low pressure air flow beside the motorcycle. I had almost no buffeting on the helmet sitting upright either. Bottom line : first impressions of the CBR650 are mediocre to poor, but real world riding (I put 4000km on it in two weeks) reveal a truly excellent motorcycle for all occasions. Great article, I long for my old 1995 CBR600F3. Nice write up. You want a better tank range? What is the one on this bike til fuel light comes on? Can you do another test of a CB500X, which I find more interesting. The range is 280-sh, which is actually pretty amazing considering the pathetically small 14 litre fuel tank. This is a problem in almost all new street bikes, as emission control requirements keep growing the air box, there is physically less room available in the traditional fuel tank area. 300km, of range before reserve I consider a decent minimum. That is actually similar to my TL1000S, which I find a very comfy bike. I agree fuel tanks are getting smaller, that’s why I have a ST1300 (Super Tanker) with a 29 liter tank for touring. This is an excellent article Michael! Amen to that, amen to a terrific article, and amen to the middleweights. You don’t need a thousand horsepower to get the job done. I learned all the principles of physics on the most amazing motorcycle I ever owned, a 1987 Gilera SP-01. 125cc two stroke grand prix replica (Gilera raced in the 125 championship those days, and this street bike shared zero with that machine other than some styling cues) and all of 26 hp. Since then I have owned and ridden bikes with up to 180hp, and none of them (and I mean NONE) came close to delivering that level of intimacy with a motorcycle. It *felt* faster than anything and made me feel like Rossi every time I used it. A few years ago I had the opportunity to ride a Honda CBR125R from Calabogie to Toronto – six and a half hours of undeniable fun. It reminded me why we all got into this silly business in the first place. The bike was quite capable, and my grin was from ear to ear….